Antarctic Shipping S.A. started in 2002 through the acquisition of a decommissioned Chilean Navy vessel, the historical “Piloto Pardo”, by a group of sailing enthusiasts. The ship was completely rebuilt as a luxury cruise ship for tourist expeditions to sail the Southern Pacific seas and the legendary icy waters of the Antarctic Peninsula. Our company’s shareholders represent Chilean and American interests, and it is a permanent member of the International Antarctic Tourist Operators Association, IAATO. Antarctic Shipping S.A. is proud to be the leading Chilean company that operates cruises to Antarctica, with the highest market standards in both security and quality. Up until now, a few thousand fortunate passengers have been able to live the experience of Antarctic sailing on board our vessel the M/N Antarctic Dream. 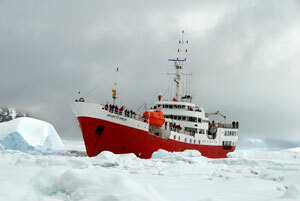 Beginning in 2008 the company began operating similar expeditions to the Arctic region. Our mission is to create and offer the most memorable and adventurous experience of a lifetime in one of the last remaining underexplored places in our world. We provide our guests the security and comfort of our vessel, the professional guidance of its experienced crew and a welcoming and friendly environment – taking into account our permanent respect for nature. To be number one in Chile in the organization of Antarctic expeditions, particularly as far as passenger satisfaction, security, entertainment, and without a doubt, learning and caring for our environment, are concerned. Take the trip of a lifetime aboard the M/V Antarctic Dream on our most popular 11- day Expedition to the Antarctic Peninsula. A land of extremes, its spectacular beauty, amazing colors reflected don the ice, wild life in full splendor and magnificent sites for visiting promises to be unforgettable for travelers in search of a unique experiences. The excursion takes in the most exciting sights of the South Shetland Islands and the Antarctic Peninsula and is oriented towards the viewing of wildlife. In mid 2008, the company initiated an exploration route to the Arctic Ocean, which transformed the Antarctic Dream into the first Chilean owned ship to offer Arctic navigation. In the first season, nearly 600 passengers embarked, highlighting this Chilean presence among a score of Dutch, Russian and Norwegian cruise lines that had previously dominated these expeditions in the Arctic. During the summer of the Northern Hemisphere, when the sun shines almost 24 hours a day, and Arctic flora and fauna is in the process of renewal, Antarctic Shipping SA invites you to a new and exciting adventure, which includes birds, seals, walruses, whales, abundant flora, much ice, and with a little luck, a view of the elusive polar bear.